It appears that the saved policies such as CS1, CS10, CS17 and DM2 relating to such areas as design, enhancing public realm, integrating sensitively with the local distinctive landscape and enhancing local character carry no weight with Bristol Inspectors and are therefore hardly worth the paper they are written on. If this is a correct assessment, some important rethinking is necessary. That the in excess of 450 objections most of which appeared to have been individually and carefully crafted representing between 6%and 7% of dwellings in KT11 could be tossed aside at the stroke of a pen. This is particularly in the context that questions were raised at the meeting with the developers as to how effective the advertising of their consultations in reaching out to the community had been. That the Localism Act of 2011 of allowing the wishes of local people to be given more weight in the decision making process seems not to have percolated down to the planning process. That the whole subject of air pollution hangs over this application like a toxic cloud. Whilst I believe all parties now accept that this redevelopment is in one of the worst parts of Cobham for persistent poor air quality and that the elderly are particularly vulnerable to poor air quality, the way forward remains opaque. If I heard her correctly, Elmbridge’s legal adviser proffered that air quality was an issue for Public Health and not for Planning; thus, no condition requiring the non-opening of fenestration, access to balconies or communal terraces overlooking the High Street could be made. Whatever the legal advice, it seems to me morally reprehensible for Elmbridge BC (for which I have the highest regard and have said so publicly) to knowingly put vulnerable members of the community at risk by allowing such a development without such conditions to go ahead. Equally McCarthy and Stone who are rightly renowned as a class act in their field of accommodation for the elderly surely, on reflection, would not want to put vulnerable people at risk. Indeed, they would be risking their own high reputation; this takes years to gain but can be lost in an instant. Thus, I hope that between now and the full planning meeting in January 2017, this application will be reconsidered by all parties and either the vulnerable residents are to be protected from harmful effects of poor air quality or this application is withdrawn. The Cobham Conservation and Heritage Trust has analysed the case officer's report which is recommending approval for the planning application 2016/2185 - 1-7 Holly Parade, High Street, Cobham, Surrey KT11 3EE. We strongly object and have included the main letter below sent to South Area Planning Sub-committee stating why we believe the application should be refused. Please come and support us at the South Area Planning Sub-Committee on Monday 12th December at 7.45pm at the Civic Centre in Esher. The Trust writes on this application, due for consideration by the South Area Planning Sub-Committee next Monday (12th December). The Trust is asking that the application be refused. We are fully aware that Councillors may find it difficult to consider long letters close to the hearing date but the case officer’s report has only been available to us for a less than a week and the issues arising are so serious that it is not possible to condense our comments. We would ask you to bear with us in this instance. 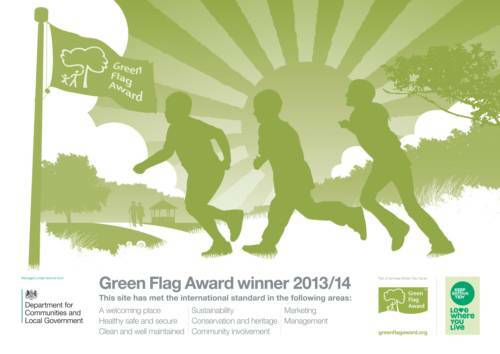 The Trust cannot accept that the case officer can consider this proposal “in accordance with the development plan”. It is noted that while she refers by title to various policies, she does not go on to recite those in her report. The Trust will do that. This lack of detail is of concern. It can be seen from Paragraph 19 of the report that the Council’s Planning Department gave pre-application advice including on “…..impact on the character of the area……. ” following which “the application was encouraged.” Thus the developers were encouraged to proceed with their model on a major application before any proper engagement with the Cobham community as to what the community would like to see and would be appropriate for this site. The Trust deals with the overall lack of taking into account the views of the community later in this letter under “Unsound Consultation”. The Trust would also comment here that the case officer looks to have the concept of 4 storeys accepted by saying that the fourth storey will not be “obvious when viewed from street level”. This is simply not true. The applicant’s own view from down the High Street shows the fourth storey (repeated in the inset montage in the addendum to the Design and Access statement). This view and the harmful view from Riverhill (footnote 1) does also show how the new building would tower abruptly and brutally above the Lloyds chemist building next door. The building would be overpowering and out of symmetry with neighbouring buildings and its jarring nature can be seen from the front elevation appended at the end of the case officer’s report. Apart from saying that the fourth floor will be set back and therefore not visible there is still no justification of why a four storey building should be allowed here. Here is the first opportunity since the Design and Character SPD for Cobham Guide was consulted on and published in 2012 for the redevelopment of a significant site in the centre of Cobham. The applicants (and the case officer in recommending permission) are looking to completely ignore that and other basic guidelines in both the Core Strategy and the Development Management Plan. We learned on Friday that the Elmbridge Planning Officer is recommending approval of the 1-7 Holly Parade application. It will now go to the South Area Planning Sub-Committee on Monday 12th December at 7.45pm at the Civic Centre in Esher to be heard by our councillors. Our resolve to oppose this application is absolutely in no way diminished and we hope to speak at the hearing. We ask that as many of you as possible come to the meeting at the Civic Centre to show support for us. The way the campaign has been conducted by the developers has not been a happy episode for our community. So much more could have been achieved had the developers wished to consult properly, rather than impose their own solution on us all under the guise of a consultation. Elmbridge Borough Council has reassessed its housing need through to 2035 and concluded that it will need to nearly double the number of new houses built to 474 per annum. This cannot be met from existing brown field sites alone and it will have a massive impact on our green belt. We are not talking about a few houses but big estates. The number of houses in Cobham and surrounding areas could nearly double in the next 20 years. Cobham, Stoke D'Abernon and Oxshott would merge into one in terms of the built environment. The infrastructure would be overwhelmed in terms of roads with even greater traffic gridlock, car parking, doctors' and dentists' facilities and schools. There is at present no joined up thinking between local authorities. The Guildford proposal for over 2000 houses at Wisley has now been appealed and there will be a public enquiry. If this were to go ahead it will put massive pressure on our infrastructure before even thinking about Elmbridge's proposals above. One of our senior councillors, Cllr James Browne, has very kindly agreed to come to the next Cobham Heritage open meeting at the Cobham Village Hall, Lushington Drive on Wednesday 14th December at 8pm to talk about this. 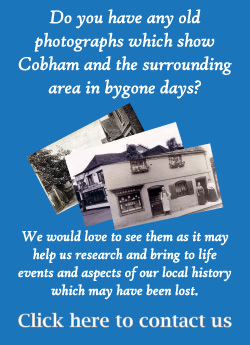 All Cobham Heritage members are encouraged to attend to find out more. Pupils from Year 2 at Royal Kent have seen the fruits of their school’s sponsorship by the Cobham Conservation & Heritage Trust displayed publicly at the library in Cedar Road, Cobham. The Trust funds their membership of the Elmbridge Museum Schools Outreach Scheme which means that teachers can access workshops and resources to bring curriculum projects to life using local history and artefacts. The Trust has also joint-funded, with Elmbridge Borough Council, the museum cabinet in which the children’s work is displayed. Their clay animals and decorated plates are the result of creative workshops based on the pottery of the Wren family who worked in Oxshott from the 1920s to late 1970s. 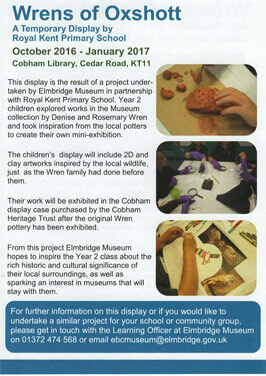 The aim of the Trust’s collaboration with Elmbridge Museum is to bring local history alive for all ages, and we are therefore very pleased to share this example of the inspiration children can gain from learning about the crafts and interests of their ancestors. 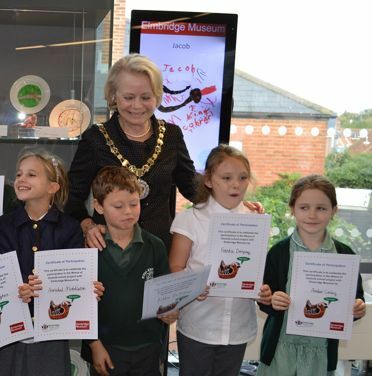 A special celebration was held at the library in the Cedar Centre on 13th October 2016, where certificates were awarded and the Royal Kent pupils were congratulated by the Mayor of Elmbridge, Councillor Tannia Shipley. The exhibition will continue at the library until January 2017. Do go and have a look! The Cobham Conservation and Heritage Trust will continue to fund local schools so that they can have access to the Elmbridge Museum collection and its education officer. This British documentary film was taken in 1916 during the early days of the Battle of the Somme by two official cinematographers, Geoffrey Malins and John McDowell. The film has been digitally restored and enhanced and provides a powerful insight into the conditions endured by British troops during this time. The original film was released generally in August 1916 and watched by about 20 million people in Britain in the first six weeks of exhibition and distributed in eighteen other countries. 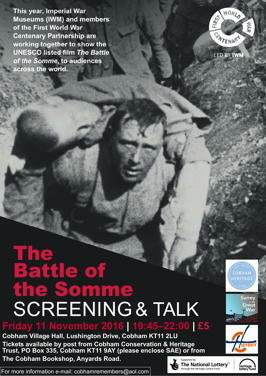 Our special Battle of the Somme film screening and talk takes place on Friday 11 November 2016 at 19:45 at the Cobham Village Hall, Lushington Drive, Cobham, Surrey. Tickets are £5 and available from the Cobham Bookshop, Anyards Road, Cobham.